The Scarff professorial chair allows Lawrence University to bring to campus distinguished public servants, professional leaders, and scholars to provide broad perspectives on the central issues of the day. Scarff professors teach courses, offer public lectures, and collaborate with students and faculty members in research and scholarship. 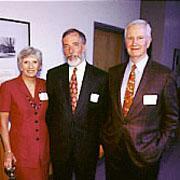 Mr. and Mrs. Edward L. Scarff created the professorship in 1989, in memory of their son, Stephen, a 1975 Lawrence graduate who died in an automobile accident in 1984. In the photo, the Scarffs are pictured with G. Jonathan Greenwald (center), former United States minister-counselor to the European Union and the 1998-99 Scarff Professor. Recent Scarff visiting professors have included William Sloane Coffin, Jr., civil rights and peace activist; David Swartz, first U.S. ambassador to the Republic of Belarus in the former Soviet Union; Greenwald; Takakazu Kuriyama, former ambassador of Japan to the United States; Charles Ahlgren, retired diplomat and educator; and George Meyer, former secretary of the Wisconsin Department of Natural Resources, Robert Suettinger ’68, Intelligence analyst and China policy expert, and Russ Feingold, former United States Senator from Wisconsin. Former U.S. foreign service officer and deputy head of the Organization for Security and Cooperation in Europe (OSCE) Mission in Croatia. Director of the U.S. Environmental Protection Agency’s Policy and Program Change Division. Former U.S. Ambassador to the Republic of Moldova (1998-2001), head of the U.S. Embassy in Belgrade in the mid-1990s and U.S. Special Negotiator for Eurasian Conflicts, 2001-04. Spent 35 years as U.S. foreign service officer, retiring in 2006. Senior scholar at the Woodrow Wilson International Center for Scholars in Washington, D.C., former director of the Washington Office on Latin America (WOLA), an independent nongovernmental organization concerned with human rights and U.S. foreign policy. Former President of the International Rescue Committee, the largest refugee resettlement organization in the world. Before leading the IRC he was president of Columbia and Rice Universities and Dean of the Harvard Divinity School. Most recently served as political advisor to the Supreme Commander of NATO forces. Prior to that he was the U.S. Ambassador to the Republic of the Congo. Baer recently stepped down as Associate Attorney General in the Obama Administration. Previously, he was Assistant Attorney General for the United States Department of Justice Antitrust Division. Hendry is senior advisor to the International Association of Women Judges where her focus is on sexual harassment law. They are married and both graduated from Stanford Law School.